With a prescribed note from your doctor, medical massage treatments will accelerate the natural healing process through specific work on targeted areas. We bill PIP and L& I Claims as well as most insurances for approved medical massage services in our Yakima Medical Day Spa. Learn more about Medical Massage and how to get Pre-Approved for Medical Massage Therapy. Avoid the time, money and hassle of a lifetime of shaving or waxing away unwanted hair. With xeo© laser hair removal, you can achieve silkier, smoother, beautifully bare skin in a few easy treatments and feel more confident about your body. Developed by the pioneers of laser hair removal technology, xeo© laser hair removal provides maximum comfort, efficacy and efficiency. Regardless of skin color (fair to tanned) or hair type (fine to coarse), both women and men can enjoy long-lasting hair removal in minimal time. Stop covering up and start showing off your smooth, barer skin! xeo© hair removal gets to the root of the problem to banish unwanted hair with long-lasting results. xeo© hair removal delivers powerful, gentle light into the hair follicle to prevent regrowth. Because hair grows in phases, it's necessary to repeat the treatments at periodic intervals in order to achieve maximum hair reduction. Contact us about setting up a laser hair removal treatment to remove hair from your upper lip, chin, eye brows, arm pits, arms, legs, bikini area, stomach, chest, or back. See our Laser Treatments in Yakima page for more information on spider vein removal for facial redness caused by rosacea, pain reduction, and the anti-aging collagen building treatments with Laser Genesis. For one luxurious hour you will receive the ultimate pedicure treatment - eight specific products designed to treat your overworked feet. To finish off this amazing session, you will receive a deep tissue massage from your toes to your knees. The skin will be prepped with a mild glycolic acid to enhance the removal of calluses, your nails trimmed if you desire this service. A copper hydrating cream will be applied to the soles of your feet, ending the entire treatment. A glycolic cream will be applied to feet and legs, with a deep massage applied to the feet up to the knees. If you should desire to have your nails painted, you will need to bring your own polish, and make sure the request is made at the time of booking so extra time can be set aside for this service. When you wax, the entire hair shaft is removed, root and all, rather than cutting it off at the surface of the skin like you do when you shave. This leaves your skin super smooth with no stubble. Waxing also lasts much longer than shaving, and the hair grows back thinner and finer with repeated treatments. Does waxing hurt? In General, Yes! Although all of us have a different pain tolerance, so the level of discomfort will vary according to your threshold for pain. Most clients will experience a decrease in pain when they consistently wax over a period of time without shaving in between. Is there anything I can do to help with the pain? Taking a mild pain killer 30-45 minutes prior to waxing will help a little with the pain. There are also topical numbing creams available that you can apply 30 minutes before your appointment. Avoid caffeine before waxing. If you are female, avoiding waxing the week before and during your period will reduce sensitivity. Taking these steps will decrease the amount of pain you experience, but nothing makes waxing completely pain free. How long will waxing last? The answer to this question varies from person to person. We all have different rates of hair growth, and some areas grow back more quickly than others. Your hair has various cycles of growth as well, so you want to make sure all of your hair is grown out prior to waxing, or else the hair that was not long enough to be removed will grow in a matter of days. For most people results will last from 3-6 weeks. Will I experience irritation from waxing? Yes. Again, this answer varies from person to person. Clients who have very fine hair will usually experience a slight redness and tingling sensation similar to a sunburn for a few hours after waxing. Those who have very coarse hair can also experience raised bumps around the hair follicle and redness for up to 48 hours. Sometimes waxing coarse hair in very sensitive areas can result in small blood spots from the hair follicle. 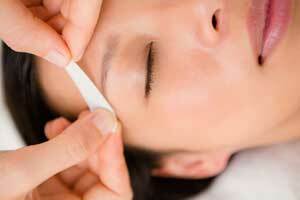 Usually, facial waxing results in minimal irritation while areas waxed on the body will have a longer recovery period. How long should my hair be for waxing? The best bet is about half an inch. For most people, this means waiting two weeks after shaving before you wax. Will I get ingrown hairs from waxing? Those of us who are prone to ingrown hairs will experience them no matter what hair removal method we use. To help with ingrown hairs, use a scrub three times a week in the area that is prone to getting them. Moisturizing your skin in conjunction to using the above techniques is important as well. How should I care for freshly waxed skin? Avoid touching the area that has just been waxed, since bacteria from your fingers can easily be transferred into your hair follicles, causing breakouts. For facial waxing, avoid makeup for several hours. For body waxing, wear loose fitting clothing. Avoid heavy workouts, sun exposure, very hot baths or fragranced lotions for 48 hours. A peel treatment that tightens pores, reduces Oil, renews skins texture and provides a burst or radiance to your complexion in less than 10 minutes. Chemical peels can be done on the face, neck, or hands. A light chemical peel is a non-invasive treatment that removes the upper layers of dead and damaged skin and encourages skin cell regeneration. This type of peel provides gentle treatment for fine lines, acne, chronic dry skin, and uneven pigmentation. The formulation of the chemical solution used in a light chemical peel depends on the needs of the individual patient. When applied to the face or another part of the body, the AHA chemical peel solution works by removing the outer layers of skin so that a new, smooth layer of skin is revealed. The action of the chemical solution stimulates the production of elastin and collagen, essential components of healthy, youthful skin. Winter is the best time to have a Peel because the weather is on your side with less sunlight, which means lower UV levels and a perfect environment to heal your skin more quickly. Have a peel now to exfoliate and refresh your skin or have a series to significantly improve your skin before next summer.” The benefit from a series of 4 to 6 peels is that it targets the deeper layers of the epidermis for enhanced exfoliation and cellular turnover which produces healthy, glowing skin. Also, hyperpigmentation is better improved by a series of chemical peels. In order to allow your skin to heal between treatments, a series of peels are spaced 4 to 6 weeks apart.